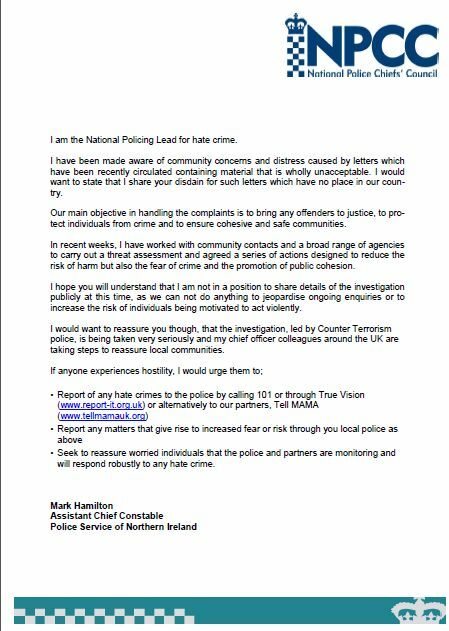 I am the National Policing Lead for hate crime. I have been made aware of community concerns and distress caused by letters which have been recently circulated containing material that is wholly unacceptable. I would want to state that I share your disdain for such letters which have no place in our country. Our main objective in handling the complaints is to bring any offenders to justice, to protect individuals from crime and to ensure cohesive and safe communities. In recent weeks, I have worked with community contacts and a broad range of agencies to carry out a threat assessment and agreed a series of actions designed to reduce the risk of harm but also the fear of crime and the promotion of public cohesion. I hope you will understand that I am not in a position to share details of the investigation publicly at this time, as we can not do anything to jeopardise ongoing enquiries or to increase the risk of individuals being motivated to act violently. I would want to reassure you though, that the investigation, led by Counter Terrorism police, is being taken very seriously and my chief officer colleagues around the UK are taking steps to reassure local communities. Seek to reassure worried individuals that the police and partners are monitoring and will respond robustly to any hate crime.